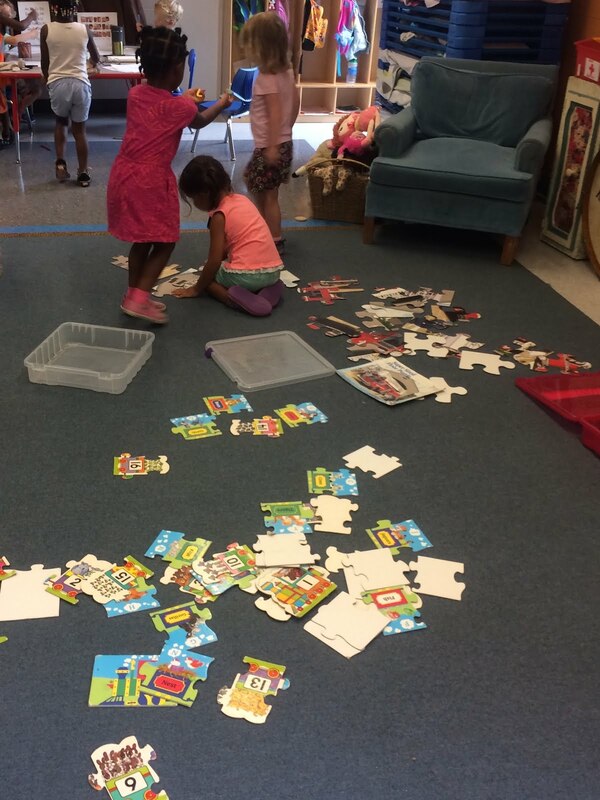 Pondering Preschool: How to put the puzzle pieces together? Have you ever watched a group of preschoolers create a floor puzzle together? Everything that children need to learn about sharing can be learned through this one activity. Simply place the puzzle box on the floor and invite children to join you - and, wow, watch the fun unfold! The play begins wildly, boldly, instantly, and selfishly, with each child automatically grabbing one or two pieces and trying to shove their own pieces together. Three year olds are used to playing with things by themselves and for themselves. They are not accustomed to working with others. The first few moments of puzzle-making are fast-paced motion...the grabbing of a piece or two, trying to connect the pieces, dropping puzzle pieces in frustration, and moving onto another piece immediately to see if it matches. 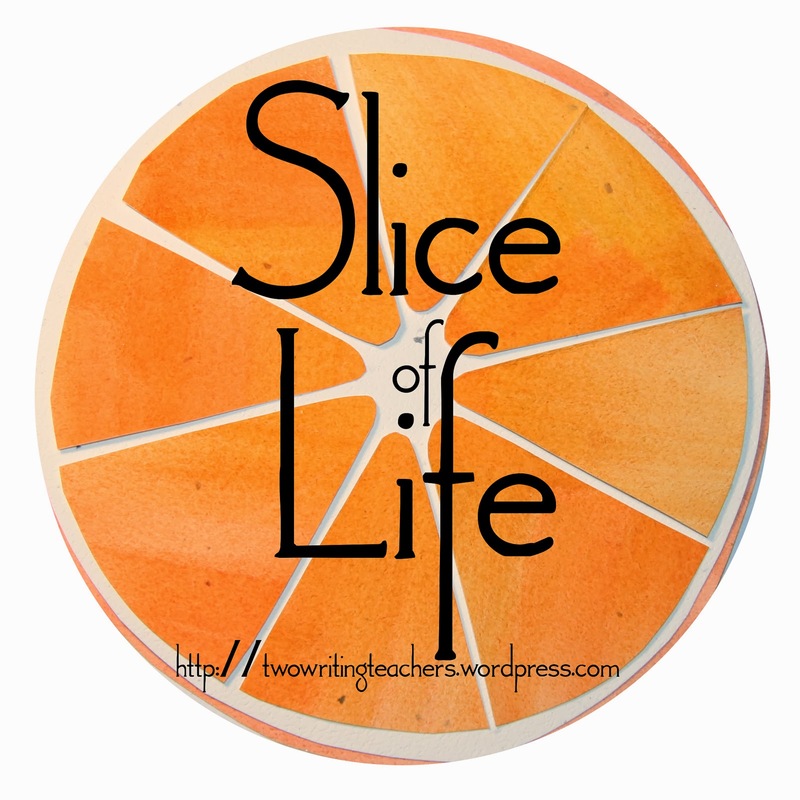 Many hands moving quickly, mashing pieces together on the floor, stepping onto pieces or bumping into a classmate, whirling, spinning, commotion. Most preschoolers seem to readily grasp that the pieces fit together in some way; I have never had to explain this. There are typically about 20 pieces, meaning a small group of preschoolers can grab one or two pieces each, and each feel very powerful. Of course, in reality, there's not much exciting about one or two pieces of a puzzle. There's not much to see or make, with so few. Often, one child will walk off to the periphery of all the commotion, clutching a piece, not seeking out any other pieces, and, seemingly, feeling no need to participate in the puzzle building. This savvy child! They may look disinterested, but they have claimed some very valuable real estate. Yes, they are holding what will be the LAST piece of the puzzle...ha! This piece is being ignored right now, but, without a doubt, it will become very important very soon. As teacher, I try simply to moderate the overall process. I try not to direct the children to follow 'my approach.' For example, I don't say - "Hey, let's grab all the straight edges first." - which was definitely the way I was taught, many years ago. I enjoy watching preschoolers find their own way, to figure it out...I trust that they will. I sit back a bit, and use my voice mostly to guide - helping them work together. Sometimes the puzzle piece that you simply must have is in another child's hands, and, here, it's often easiest to just grab the piece out of the other's hands. Teachable moment! I pepper them with questions - "Who had that piece first?," "Did you ask her if you could have that?" "Where do you think it goes?" "What makes you think so?" "How do those two match up?" Many instinctively know to turn the piece around and around and around, exploring new positions, to see if the pieces will connect. As the children work, I begin to build some ground rules with them - "If two pieces are connected, you leave them be and try to match your piece to the connected ones. Don't take apart what is already working." Somehow, this often seems to surprise preschoolers - as if, "Wait, I didn't match those pieces! But, you expect me to leave them be?" Another important rule, "We don't take pieces out of our classmates' hands." Also, "Puzzle makers move slowly and purposefully, they don't stand on the puzzles." I am frequently amazed at the ferocity and motion involved in making a puzzle together. Around and around and around they go, testing this piece against the other. with interconnected sections becoming more apparent. I often wonder if this is the very moment that young children become aware of the power of team work..the very moment they become aware that, wow, perhaps each person has something to offer to the process...the very moment each child begins to literally see how what they are doing connects with that of others. Although the puzzle begins with every child feeling and working solo, in the end, it is completed by the work of many...it takes a team. The learning from such a simple 'toy' is truly profound. Children learn to be more observant of one another and of the puzzle, noticing details on each individual piece. They begin to interact with one another, communicating - "Does this go here?" "Put yours there." "Here!" "Look! These go here!" And that child who might have wandered off with that one piece? Oh, yes, we need her now! You can't finish without a floor puzzle without including everyone. the second, enlightenment, the mind opens, the realization comes - we do better when we work together. There's always a big round of applause at the conclusion of a puzzle! Go, preschoolers! This post reminds me of how the most important lessons come from the seemingly simple games we play. Now I want to put a puzzle together! I loved the descriptions of the action and the way your observations weave theough them. Of all the keen observations about how these small people— and big ones, for that matter— learn, the one that strikes closest to my heart is “I enjoy watching preschoolers find their own way, to figure it out...I trust that they will.” That trust is powerful, and beautiful. Thanks for showing it so vividly.